As September draws to a close — where has this year gone? — I'm trying to catch up on the year's releases. Here are two more, and look for more multi-scent reviews over the coming month. Secret fire of the alchemists: the elusive scent of iris root smolders with spice, cedar and smoke in a transformative hidden fire. Bright, joyful, ardent. Feu Secret is from artist and indie perfumer Bruno Fazzolari, and I'm surprised I haven't seen more mention of it in the comments here. Fazzolari's descriptions are right on target: after a brief but bright citrus opening, this is a warm spiced iris, given some lift by the hemlock spruce and eucalyptus (other notes include turmeric, pink pepper, himalayan cedar, birch tar, vanilla), and just a wee tad smoky — you'll be reminded of incense, but you won't feel you've been marinated in campfire. Likewise, it is earthy / rooty, but doesn't move into turnip territory, and there is a touch of sweetness in the base, but it's not so sweet (or heavy) that it would sit in my cabinet gathering dust. Verdict: Fantastic. If you like iris, do just try it. It would slot neatly into 5 perfumes: iris fragrances for fall, but I've also worn it happily through the heat of summer (yes, I've been meaning to write this review for months). It will definitely make my best of 2017 list, and my buy list, although I almost never buy anything and I might not buy this either. But I'd love to have a little duo of travel sprays of this one and the (also fantastic) Lampblack. 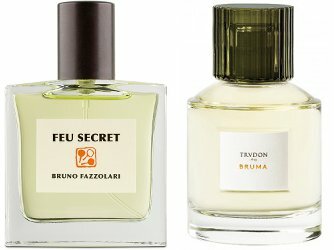 Bruno Fazzolari Feu Secret is $125 for 30 ml. For buying information, see the listing for Bruno Fazzolari under perfume houses. Bruma was my early favorite of Cire Trudon's debut set of five fragrances (I've already reviewed Deux). It is named for the Latin word for solstice,3 and was developed by perfumer Antoine Lie. It starts with a buttery iris-violet, liberally peppered, but it stays airy and chilled, in an entirely different register than the earthier, rootier Feu Secret (the notes: black pepper, lavender, galbanum, violets, peony, iris, jasmine, labdanum, vetiver, tonka bean). After the top notes fade, it's an airy sheer-ish floral, only a little green, and not about iris at all, really, although some vague thread of cosmetic powder remains through the dry down. While it is mostly pale and clean-ish, there is just enough vetiver in the base to give it an earthy finish — not quite what I'd call an "almost animal-like sensuality", but close enough. Anyone could wear it, but it leans closer to feminine than masculine (thus, perhaps, the "feminine rider"). The lasting power is ok but not wonderful. Verdict: Bruma is beautifully done. It's modern, and it's elegant and wearable (and seasonless) without being at all stupid. It smells exactly like what it is — an expensive fragrance from a chic French brand that you can't find at Macy's. If I had to work every day in an office, and I wanted to smell good without smelling like everyone else on the street and without offending my co-workers, Bruma might be exactly the sort of scent I'd choose. On my way out the door every night, I'd layer on a spritz of perfumer Yann Vasnier's invigorating incense, Mortel, to shake off the worries of the day. (Then, later, relaxing at home, I'd be in Bruno Fazzolari Feu Secret.) It would, really, be nicest to have the coffret (all five Trudon fragrances in 10 ml sprays for $110), as I do like all of the five, even the powdery spice-fest Olim, which I hated on first sniff but have slowly started to appreciate. Cire Trudon Bruma is $190 for 100 ml at Cire Trudon or Barneys. 1. First quote via the fragrance description, second quote via Orris Butter: The Phantom at the Bruno Fazzolari blog. 2. From the fragrance description. 3. The brand says it is named for the Latin word for solstice, anyway. I don't speak Latin, but I think bruma actually refers to the winter solstice and/or the shortest day of the year. Both of these sound nice, really want that coffret! It’s a nice mix of well done fragrances. Not sure I would need any of them in 100 ml even if I was still buying 100 ml bottles, but 10 ml of each sounds right — and would guess they’re also individually swappable. I almost put Feu Secret in the Top Ten of Fall – it is lovely, I’m surprised I haven’t heard more about it, too, and in the end I maybe didn’t include it because it seems fairly all-season. And delighted to hear about the Cire Trudon: I love the candles and I love Antoine Lie, so that sounds like a must-try. Thanks for the reviews! That’s funny, Erin — I wish you had, it’s still bothering me how many fragrances you had on that list that I’ve never smelled! I like that that means we’re covering more ground, but it’s (mildly) disturbing to me that I can no longer think of myself as a literate perfumista. Nor am I willing to invest the time and energy to keep up, so that’s just how it is! I have been thinking about that all week — how am I going to even think about best of 2017? I have no idea what the best is when I’ve smelled such a small fraction of the output. I have seen complaints that the candles are more interesting than the scents, and maybe they are, but it seems to me like a good first set and I assume they’ll possibly branch out a bit more as they go. What’s your favorite CT candle? r: speaking on behalf of Erin…ha!…you really must, absolutely, positively buy Mademoiselle de La Vallière…my all-time favorite. I think it’s sensational and must buy myself one at Christmas. I’m not sure I’ve smelled the Mademoiselle de La Vallière one! Must get on that. I like most of them, but the only Trudons I’ve ever bought (other than LE or seasonal ones) are Odalisque and Solis Rex. And if you think you’re behind, Robin… yikes! I got to some indie samples this year, but I’m perilously behind on niche and some mainstream lines. Looking at that ‘Recent Reviews’ sidebar always makes me nervous. Oh gosh, I’d love to try the Feu Secret! It sounds absolutely wonderful. If you love iris…see Pixel’s comment below! And I assume even some iris lovers won’t like it, but I sure do. I prefer creamy, leathery, rosy iris … Chanel no.19 EDP is my drug of choice but this sounds really nice and a little fun. As does the rest of the Bruno Fazzolari fragrances. Thanks for posting this! Yup, I’m going to need that Portfolio Set! OMG, really?! For European readers too? I’ll definitely keep an (extra) eye on this site. Yes, I’ll do it worldwide since it is not big or heavy. I wasn’t a fan of Bruno Fazzolari’s Feu Secret (iris is generally not my thing), but I did just buy a bottle of his latest, Unsettled. It’s a somewhat beachy/tropical sandalwood. Very nice. If iris is not your thing, you definitely don’t need Feu Secret. And I still need to try Unsettled! I’d LOVE to hear more about Unsettled. I think Fazzolari is a genius, and even his scents that I don’t need, I deeply respect and get all fangirly-weird over. But a beachy sandalwood??? That sounds amazing. These sound lovely, both of them. Funnily my bottle of Bois d’Iris is not getting a whole lot of attention either. But whenever I do wear it I love it. It’s in a way rather forgettable, I wear Dior Homme, another sweet iris, far more. I would say the same — when I do wear it, I’m happy with it. I just never seem to reach for it. It was not a good buy for me, and one of many that made me stop buying large bottles of anything. I’ve got a partial bottle that didn’t cost me a lot, but it does go unnoticed most of the time. I probably wear TDC Bois d’Iris the most. Excited to see these reviews! I liked Bruma, but found it a tad boring. Nothing animal-like registered in that one for me. I’m still tempted by the set, though. I tried the Fazzolari when it first came out and remember having a mixed reaction to it, but don’t remember why. Some of his scents have a weird vegetal thing running through them which works for me in some of his scents (Au Adela, yes, Seyrig, no). Need to retry. And I’d be thrilled with even 5ml of Lampblack! Lampblack is such a great scent, and I don’t see that one mentioned frequently either. Bruma cannot live up to its billing — “a magnetic and carnal aura” is really a bit silly given what it is, and I am less forgiving with expensive niche using that kind of overblown nonsense than I am with cheaper designer brands, who I *expect* to spout garbage. But, I find really pretty, elegant scents that you could wear anywhere to be fairly rare, so I appreciate one when I find it. I wore it last week next to Ralph Lauren Woman and it was like a little object lesson in why designer fragrances are failing. I love Feu Secret! I wore it a bit in late-late spring, but am super-excited to break it out again for fall (whenever that finally gets here). It reminds me a bit of Iris Nazarena, but not so much I didn’t need both (I am an iris hound). I am so with you on Bruma. There is never an occasion when one couldn’t wear it and yet to me it isn’t boring at all. It makes me very cheerful. I really like Feu Secret too although I tucked it away for fall as it seemed a bit spicy for me for summer. Not sure why, but this summer at least I didn’t wear much orris. Scents like Bruma are not really perfumista bait, I think! But that’s ok. Guessing the perfumista bait in the set is possibly Mortel or Revolution? And Olim will find fans amongst the powder hounds. Does that mean there are other things that smell like it or that it’s too . . . calm? Never sure what counts as perfumista bait. I like all of the set except, so far, Olim. ???? I really hated Olim when I first smelled it! But then when making a sample of it for someone else, I ended up with just a drop on my skin, and after it settled, it was gorgeous. So I gave it another try — I think too much of it makes me feel claustrophobic, but a little bit is lovely? I shouldn’t act like I know what is perfumista bait and what isn’t, I’m just guessing! But I do think sometimes we spend so much time sniffing about for the amazing, hugely unusual scents, and “just pretty” seems not good enough, if that makes any sense. Totally makes sense. But sometimes I want ‘pretty’ and I am now realizing that a lot of things that go on that way give me headaches. Hence my deep appreciation for Bruma! I actually thought it smelled too familiar to me, in the vein of Lipstick On or like a dilute version of Byredo 1996, maybe. Yes I can totally see that. This is where my particular experience with aromachemicals comes in. A lot of Byredo makes me a little queasy. A lot of Hermes, which I can see this as like too, give me a headache. For some lucky reason, Bruma doesn’t bother me that way. And boy I sound like quite the gentle flower! I tried Feu Secret when it first came out. It seemed OK but not really compelling at first sniff, so I went on to other things, intending to try it again. This is a timely reminder. I was immediately intrigued by the Cire Trudon set, so I appreciate your reviewing some of the scents. I’d have bought the set by now, normally. However, this summer I found a discounted bottle a very expensive perfume that I’d wanted for years and finally pressed the BUY NOW button. I am attempting to compensate by abstaining from buying for a while. Hope this set is still around in a few months! WELL? Aren’t you going to tell us what it is?? Roja Dove Diaghilev. Donatella would be so proud of me! Indeed, I am sure she is glowing with pleasure right now. Congrats on your new bottle! Typed the words right off my keyboard !! OK, so I found my sample of Feu Secret and am really enjoying it tonight. Don’t know if it’s because early fall is its season, or my nose is just tuned differently now. It reminds me slightly of Kenzo Amour. Well done, Bruno Fazzolari — again! And thank you, Robin, for your timely review, which prompted me to excavate the sample and try it again. Glad you like it the second time around!